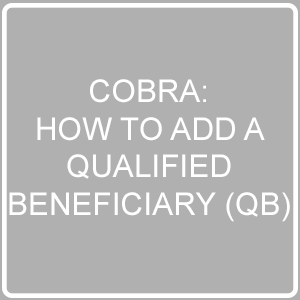 When a qualifying event causes an employee to become eligible for COBRA, they must be added to the system as a new QB. The QB’s general information is required along with the event information. You will then apply the appropriate plans for the QB’s continuation of coverage. If there are any dependents, they are to be added as well. The last step, if required, is to put in place a subsidy schedule. Step 1: From the HOME page of your company’s CLIENT PORTAL, click ADD MEMBER. Step 2: On the next page, click NEXT under QUALIFIED BENEFICIARY. Step 3: On the next page, enter the QB’s basic profile information. When finished, click the NEXT button to continue to the EVENT page. Step 4: On the next page, unless specifically used by your organization, you can leave the Tobacco Usage, Employee Type, and Payroll Type as “Unknown”. Under Premium Coupon Type, always select “Coupon Book”. Under EVENT CATEGORY, select the “Employee” radio button and enter the required event information. 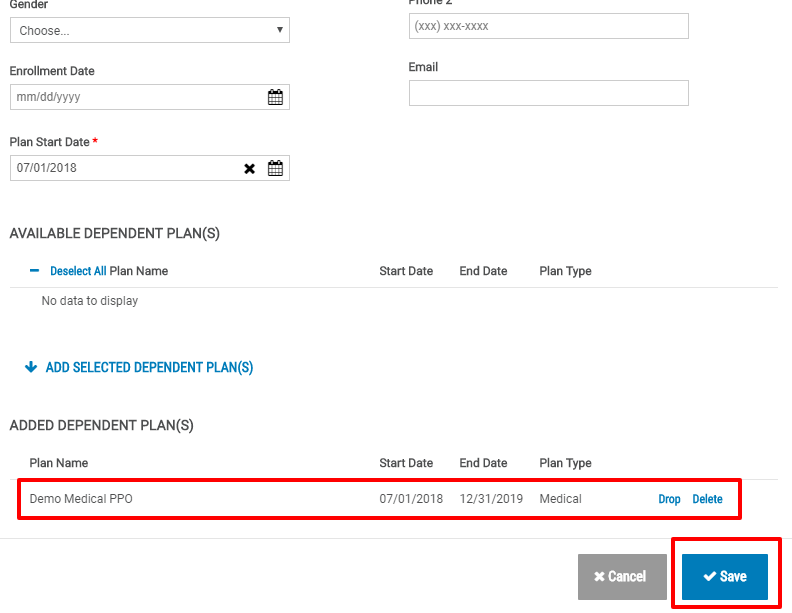 Under EMPLOYEE INFORMATION, enter the employee’s name and SSN, and then select the NEXT button to continue to the PLANS page. Step 5: Now you have to add the plans for the QB. From the PLANS page, select the ADD A PLAN button. Step 6: Choose the PLAN and COVERAGE LEVEL. 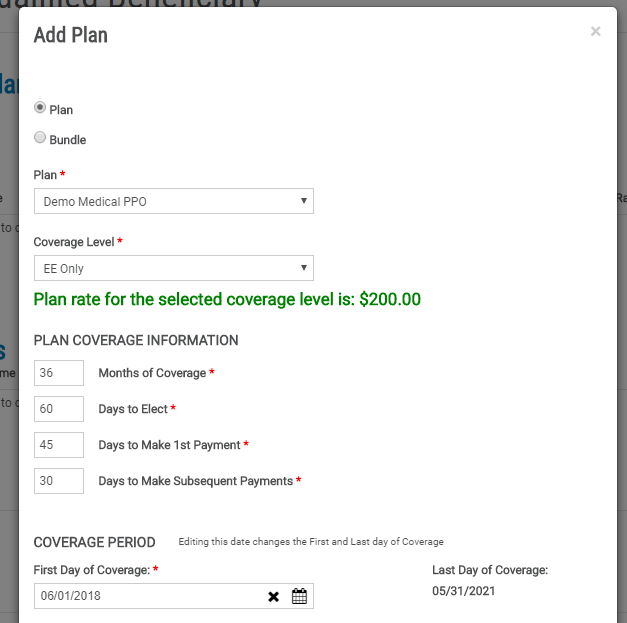 The number of months of coverage, days to elect, days to make 1st payment, and first day of coverage will all automatically populate based on the QB’s event date and event type. Click the SAVE button to include the selected plan. Step 7: The first plan should now be visible. You may add any other necessary plans via the same method. As you can see below, we have added MEDICAL for EE+Spouse. So we must still add the other plans offered to our demo QB (VISION and DENTAL). Select ADD A PLAN again to finish adding the appropriate plans. 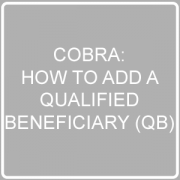 Once all of the necessary plans have been added for the QB, select the SAVE AND CONTINUE button to go to the DEPENDENTS tab. Step 9: The next step is to add all dependents to be included in the continuation. Select the ADD A DEPENDENT button to continue. If the QB you are adding does not have any covered dependents, simply click SAVE AND CONTINUE. 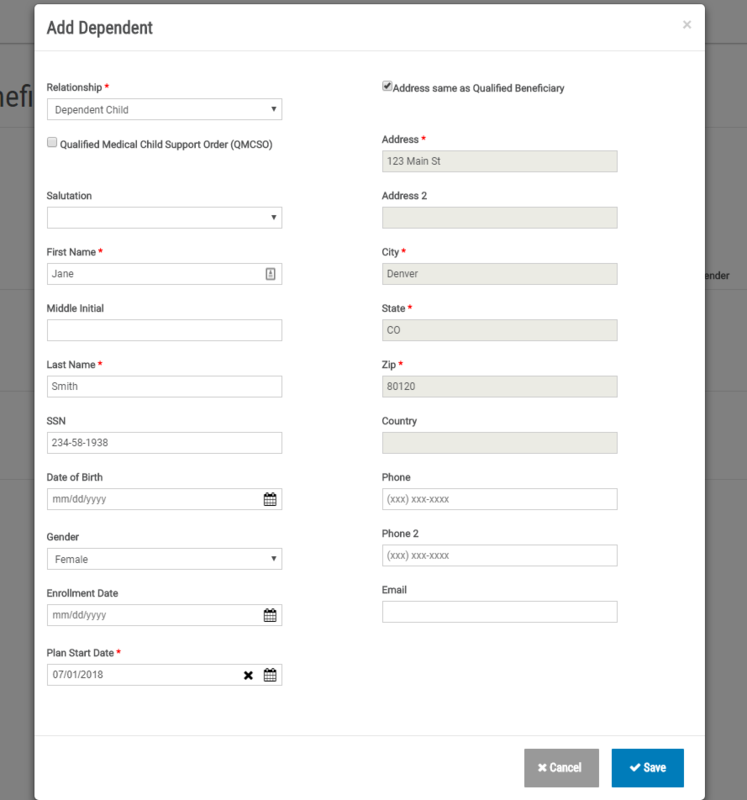 Step 10: Enter all of the required fields (with red asterisk), and please include the SSN and DOB. Select the SAVE button to continue. Step 11: After adding the dependent’s details, you will see the Plan Information appear below. 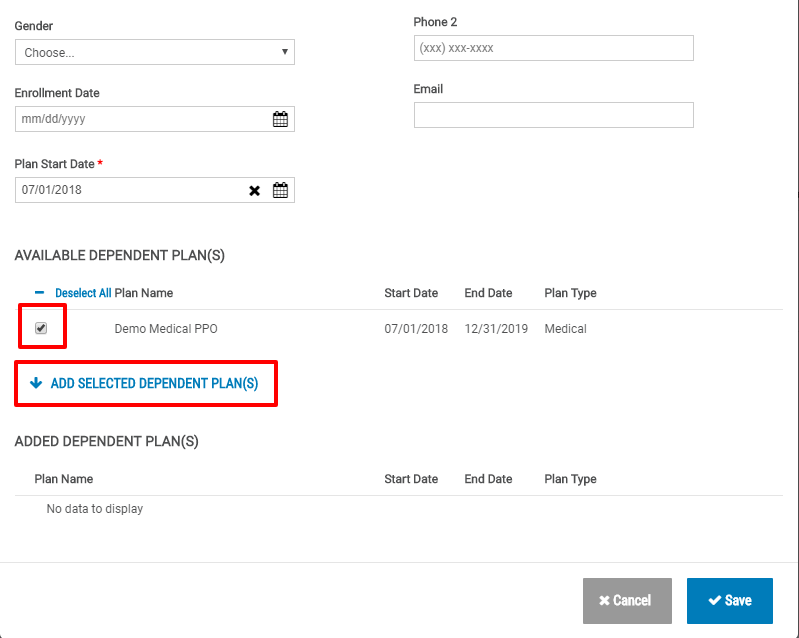 Check the box to select the plan(s) that the dependent should be offered, then click ADD SELECTED DEPENDENT PLAN(S). 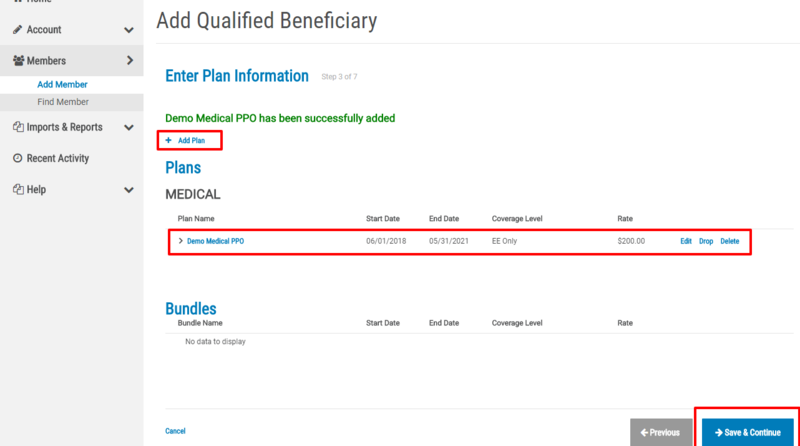 You will see each added plan appear in the list under “Added Dependent Plan(s)”. Step 12: Once all plans appear under Added Dependent Plan(s), click SAVE. Step 13: Now that the first dependent has been added, you may add any others that may exist. If there are no other dependents to add, then you can select the SAVE AND CONTINUE button to continue to the SUBSIDIES tab. If you do not need to add subsidies, just click SAVE AND CONTINUE. Step 14: On the Subsidies page, select the ADD A SUBSIDY SCHEDULE button to set the details of the subsidy. If no subsidy is necessary, then click SAVE AND CONTINUE. Step 15: Set the SUBSIDY SCHEDULE by completing the required fields. The Subsidy Schedule Start must be set to the first day of the month in which the subsidy goes into effect. When finished, click ADD (for more detailed information on adding a Subsidy, click here). Step 16: Review and edit the subsidy details if desired. Click SAVE AND CONTINUE to proceed. Step 17: On the next page, you will have the option to add Letter Inserts for states that require additional information to be included with the Specific Rights Notice. If your Qualified Beneficiary lives in one of the states listed, simply check the box next to the letter insert. When finished, click SAVE AND CONTINUE. Step 18: On the final page, there is no action you need to take. Simply click ADD MEMBER if all previous information added is correct. Congratulations! The QB has been added. You should be directed back to the home page with a confirmation message stating that the QB you entered has been added.